Hello fellow educators! Another school year in the books! Can you believe you it? You have made it through another year of excitement, challenges, laughs, tears—just another emotional roller coaster. But it was worth it, as students exit your classroom with more knowledge, skills, and experience under their belts. All thanks to you! So our students have left with more, but what about us? Did we leave the year with more tools or knowledge under our belts? Do we feel more equipped as teachers? Do we have what we need for another year of teaching? Do we have what it takes to keep educating our students to prepare them for their future? Before I go on and on about extra work for teachers, let me introduce myself. I, Anh Nguyen Delos Reyes, am also an educator, like many of you who may be reading this article. I just finished my ninth year in education (crazy!). And I applaud those who are new teachers, and those who are veterans! I have taught in Oakland and San Diego, with experiences in teacher leadership, nonprofits, and admin work. My focus is elementary, but I have dabbled a little with middle school and some outdoor education. My career began by just focusing on teaching, but as I delved deeper into the work, I began to realize all the opportunities that were opened to me as an educator, and that my role was not limited to just teaching! To be a teacher, one needs to continue to learn! With summer here, we ask ourselves, what is next? What can I do to be more prepared for my students, my community, my school? Yes, it is summer, so please go ENJOY it. But if you are looking to move on the salary schedule (for work you have already done) or to beginning planning for next year, or interested in learning about educational leadership. I may have a few things you might want to take advantage of. Some of these programs will even pay you to attend. First and foremost, always check in with your admin and/or district to see what is offered. If you are a part of Oakland Unified School District, check out OUSD intranet, and click on On-Trak for a list of professional developments available. They have something for everyone, and some will even be related to the curriculum your school may be using! Most of the PDs will also provide planning time (yes, real planning time!). OUSD will also pay you to attend, yes PAY you to attend. If you are not part of OUSD, email your admin, I am sure they would love to hear that you want to keep growing! Not in a district? At my charter in San Diego, they were willing to send us to other district’s PDs or the county’s. Always ask! If you are already a teacher leader or maybe you are ready to do some exploring in leadership, these are a few options. Cornerstone is put on by UC Berkeley, it is a great way to learn and practice those teacher leadership skills right at your site. Want more practice or deeper understanding on how to push not only student efficacy, but teacher efficacy as well? Check out New Leaders , they have programs that can help you in all levels of leadership (thinking about being a principal?). We can not forget all the universities that offer Administrative Credentials programs as well. Reach School Leadership may also be an option, they do have a rolling admission process. Though the classroom is our forte, we too can make a difference at the leadership level! There are also learning opportunities happening outside your school, that may not be tied directly to your curriculum, but can definitely lift your instruction. The Bay Area Writing Project has a workshop for every grade level, and all centered around writing practices. Their PDs are given by educators, just like yourself! They also provide workshops for those who are interested in joining their team. It is a great opportunity to gain some leadership, and money! They have workshops throughout the year, not limited to just summers. Learn more here! One more great way to keep moving up the pay scale, University of Pacific, with Courses for Teachers will allow you to earn more credits, so that you can move onto the next column! The courses are designed around extracurriculars that teachers already do (planning field trips, researching and creating lesson plans outside of your curriculum), just a quick type up of the hours, and you can purchase units (transferable!) to move you along on the salary schedule! I hope this provides some insight into extra learnings we all can do, and that you take advantage of at least one of them! However, please do go and take time for some most deserved self-care! If asked to describe myself, the words "kind" and "caring" would come to my mind—I have always found joy in taking care of others. That's part of what led me to become a teacher. And yet, I haven’t always been good at being kind and caring to myself. In my previous role, I was the director of a burgeoning special education program that was a department of one: me. I was a captain, but I was lacking a crew. In many ways, this role was an amazing opportunity. I was able to use creativity and critical thinking every day. I felt like I was making a difference and that my work was important. I had great relationships with my students and their families. But I was drowning. Sunday nights were the worst. My anxiety about the upcoming week would consume me. I often stayed up half the night working and worrying. Looking back, I can’t even remember the details of what work filled my time or made me so anxious. As any teacher will tell you, the work never ends. And for me, stress began to build up and accumulate. Some days I would cry in the car on my way to work and hope that my students couldn’t see how terrible I felt. I had this fear that if I stopped working—constantly—even for a moment, everything would fall apart. My family and friends advised me to just turn off my work computer and stop at the end of the day or on the weekends. “But they have never been teachers!” I’d tell myself. They didn’t understand the situation. There’s always more to do! In my new (current) role, work has felt much more manageable. Those close to me occasionally ask why this year feels so different. In some ways, it is the priorities and mindset of the school and administration. For one, I get thirty minutes of paid work time bi-weekly with the Teaching Well to prioritize my own self-regulation and wellbeing in one-on-one mindfulness coaching with found, Kelly Knoche. By and by, I have learned to accept the grace, patience, and spaciousness that others offer me and extend that grace to myself more often. I realize now that it wasn’t necessarily the environment or the role that I was in, but rather my own inability to self-regulate and prioritize my own life beyond and outside of my classroom. I think about those moments, overwhelmed and crying in my car, and I realize how obvious it is that you can’t give 100% to your students if you’re not at 100% yourself. Making sure that I am committed to taking time for self care—even just 5 or 10 minutes of quiet within my ever-chaotic days—has helped to make this my most successful year yet. I love my students as whole people, with all of their struggles and amazing successes. And, now, I’m learning how to bring that love home to myself, too—along with all of my struggles and successes. I call to mind someone prim, restrained and deeply conventional. Even as someone with many friends in the field—most of them nuanced, energetic and creative people—the person I imagine doesn’t do fun things in their spare time. They mostly exist to make sure I’m paying attention to my penmanship (thanks Mrs. Cohn). I mostly speak to this teacher once a month to make sure I’m still getting my A. This teacher fears colors he or she deems “too bright.” They hear an amazing beat and feel…nothing. Isn’t it interesting that in this profession filled with individualists, thinkers, and innovators, we tend to externalize so…uniformly? I’ve seen it first hand. The best happy-hour conversationalist on staff shrinks down to the Ben Stein monotone from Ferris Bueller’s Day Off when organizing class, mediating conflict, or discussing social/emotional learning. I observed a colleague*, new to the field but well-trained, watch a child spill a whole pint of milk because she wasn’t paying attention and say…nothing. She quietly mopped up the milk and carried on with the morning ritual. To this point, I would like us to collectively consider how it affects our children to view some of their primary caretakers as emotionally monolithic or even worse—to not consider them emotional people at all. There is a devastating ripple effect when we remove our own emotional process from the emotional growth equation. In service to illustrating these consequences, I would like to share a difficult story of my own. Using my story as a case study, I’m advocating for teachers to make space for emotions by narrating their process for their students and modeling the tools they use to maintain their own well being. There was a science lesson that I was very excited about. By popular demand, we were studying microorganisms. Ebola had devastated Africa and many of my students were either first generation African Americans or had themselves recently arrived from Ethiopia and Eritrea. Naturally, they were curious, frightened, and fascinated by this terrifying disease and wanted answers. We were in the phase of the lesson plan studying more benign creatures. Ten Petri dishes were populated with yeast at exactly the right timing and temperature to rapidly reproduce under a microscope. Instructions were on the board and I had done a pre-teach of procedures and guidelines for microscope use. My students had been asking for this all week. They were so excited to finally get their hands on some “real science,” as they put it. The pre-write was going smoothly and the hypotheses were handed in, with coherence. Until that kid (you know the one) knocked over all of the Petri dishes into a bready, fermented splatter on the floor. My heart dropped into my stomach, closely followed by a warm rage that washed over my face. My lips scrunched into a wrinkly line. “Come ON Eric. Seriously?” I growled in my head. This shouldn’t have happened: the countless reviews of the expectations; posting instructions above each station in cutesy, colored fonts. We had passed the halfway developmental point of 4th grade when this should be no problem. “I don’t teach Kindergarten” was and is my favorite maturity prompting phrase. The worst part was that he didn’t even look sorry—he actually maintained the usual smug grin. I’ll just admit it. I didn’t like him. Before that moment I tolerated him. But in that moment something turned, and the dislike became personal and genuine. I opted to do exactly what my colleague with the milk carton did—just silently mop it all up. But the incident stuck with me. Much later I figured out why the exchange didn’t feel complete. From the outside, forgiving and forgetting seemed like a mature solution…but let’s look deeper into what was motivating each of my moves. The less attractive but truer version of events is this: I used a façade of calm to create an insincere teachable moment. And, as we all know, children are sharks—they can smell one part insincerity in a million parts good intention. What he heard was: “Ok, its ok.” What he felt was likely: “I’m ignoring you and your needs because I’m clearly angry and I’ve given up on even trying with you.” This suspicion is supported by the fact that Eric stopped talking to me altogether after that day. He mostly just avoided and mutually tolerated me. Another facet is that I pitted the other children against Eric by playing the bigger person. Literally. There’s nothing that decades’ edge that turns sarcasm into a weapon. “Guys, guys. It’s no big deal” was an exact lie. This lie, more than anything, served to frame ME as the awesome person. It was self-serving in the extreme. And childish. Because children, disliking the struggling member of the pack, play right into the cycle I was perpetuating. “Oh my gosh Ms. Salari!” my favorites (we’re being real, here) groaned, “Don’t worry, we’ll help.” They scrambled to clean it up. The gifted stayed valued and the struggling became isolated. teach down to his level of social and emotional learning. We’ve all been here. Now, a few more years into teaching, I know a bigger truth: we don’t teach developmentally appropriate patience practices often anymore. It’s entirely likely he never learned how to take his time and be careful. Let’s take a moment and do what teachers do best: let’s consider the student. My lobotomy of that exchange robbed Eric of an opportunity to atone for something and to grow his empathy. A mistake like this could have fostered a moment for the two of us to interface honestly—one person to another—without classroom politics interrupting. He could have felt truly forgiven and welcomed back in. I would put the rest of the class on computers, calmly assuring them that these things happen and that we can do the experiment tomorrow. I would say publically and without shame that I am upset with Eric and that the two of us need to talk. I would pull him aside, look him in the eye and tell him, step by step, everything I had to do to prepare the yeast sample. I would communicate honestly that it was really hard for me to watch him mess up all of my hard work with his carelessness. I would help him clean it up. Not do it for him, but help, so that the consequence is logical, but I am still being supportive. Finally, I would require that he help me set up the Petri dishes for the next day, and pass them out. This sequence puts the focus back on the task at hand. The point is that the class was not able to learn the lesson plan because of Eric’s lack of social and emotional development. Now I understand better that until kids like Eric have their emotional growth needs handling as well as possible, the rest of the class will not be able to learn. Here is the other major consideration in the exchange: me and my emotional health. In masking my feelings I robbed Eric of a critical growth opportunity but I did something worse to myself; I created the perfect environment for resentment to grow. Just like my little petri dishes of yeast, my resentment was warm, contained, and fed by the attention of the other students. I allowed myself to develop a fixed mindset about Eric that became a label. I shrunk my own capacity for problem solving and empathy. To make this career sustainable, teachers have to so some social and emotional learning of our own. Critically, we have to collectively reimagine the idea that adults are supposed to be monolithic providers of comfort and warmth. Instead, we can model a process of transparency and comfort with our own imperfections, giving students permission to understand their own learning curve as being human. As a teacher, ask yourself the following in the course of your interaction with a child who has recently made a frustrating mistake. Am I taking care of myself emotionally in this interaction so that I can continue this work? If not, how can I? What do I want (my student/s) to learn? How can I empower my student to learn this? What is the rest of class learning from how I handle this interaction? These four simple but powerful questions can organize and decompress the chaotic moments of frustration we all experience in classrooms. Be real. Say how you feel. Be imperfect. Do it for you or do it for them. But do it. Because if you burn out you won’t sustain this work and we need you, with all your expertise and humanity. Now more than ever. *This observation is anecdotal of course. If you are one of the yoda-level teachers I’ve met who bring their entire nuance to the classroom while supporting kids, this post isn’t for you. Also, call me. I want to learn. Kelly Knoche: Your book's written differently than many books, whether we think of a dense textbook or a narrative self-help book. Not many are a hybrid as thoughtful but still succinct enough to be bite-sized pieces that I could digest. How did you structure the book to make I digestible for teachers? Jenny Rankin: One big thing that goes in line with what you said and sets the book apart is that teachers are so busy. To sit down and read a whole book, that's a commitment. So it's organized to allow teachers to jump chapter to chapter based on what their needs are. Since every chapter is devoted to a big stressor that contributes to burnout, if a teacher starts in on that chapter and thinks, "You know, I don't connect to this. That's not a problem for me. I have really great grading habits in place, so it's not a big deal to me. "That teacher can skip to the next chapter, which he or she might totally relate to. That way it honors the fact that teachers are busy and it honors your time. Also, they can jump to their biggest stress, even if they connect to the whole book. Let's say their biggest problem is classroom management, that's where they're tearing their hair out. Those teachers can jump to that chapter and start there, start seeing some change. Then come back. "Awesome, I have a little more time now. I'm going to tackle that next chapter on administration, or on technology." I really tried to make it work for them. The same thing with how it's broken down with the checklist or bullets of a strategy. Not every strategy is going to be best suited for every teacher or every situation. But having those check listed strategies very bold and clear, backed up with information and research cited, is really straight forward on what those things are to try. Kelly Knoche: Yes. I really got that. There were chapters where I was underlining every part of the book with strategies I had created for myself, but named differently. Then, there were other portions of the book I thought, "Oh my God, that took me four years to figure out with my planning team." I think this book is very accessible for the teacher who is struggling in the classroom but also for the teacher that's thriving in the classroom. Because it really creates a bunch of avenues for that teacher to continue to hone and grow excellence. Jenny Rankin: That's great to hear. The intention was that it reach teachers at all levels, including aspiring teachers about to start so they can have good habits up front that increase their chances of sustainability. Kelly Knoche: The Teaching Well is an organization committed to supporting teacher sustainability on school sites by focusing on the well-being and the health of teachers. So the chapters on mindset, over-stimulation, and tedium address a lot of what we do. We also do a lot of inner personal work—working with teachers on how to collaborate, how to work with behavior in the classroom, how to work with the administration. I really felt my scope was broadened by how you covered logistics, grading, volume, environment, and technology. What was your strategy when you laid out the chapters of the book? Why do you think those are the first line of care that need to be addressed for teacher burnout? Jenny Rankin: I approached that in a few ways. One, I have my own ideas to start with, so I kind of have my outline—these are the things that I've seen teachers struggle with and I remember being challenging. Then there's this odd thing about my entire pack of high school friends: we're all teachers. Jenny Rankin: Some have gone to other roles, but they've been teachers. At Illuminate we have a lot of teachers. I talked to everyone. I had my list to ask them up front, "What do you think the challenges are?" Sometimes they might say, "I didn't struggle with that," so I got a lot of feedback. And there was a lot of research. I'm a bit of a research geek, so I read a lot online, studies on what teachers are rating as stressful, studies on everything. All of it shaped the list. Some things were surprising. For example, in my experience, tedium or monotony was never an issue. My experience was the opposite of that. The same things with the teachers I know. I think if we were in an older age bracket, that would more likely be the case because we would have been teaching for longer. So I was surprised that as I read the research, boredom is actually a huge reason for teacher burnout. Some people don't have that at all, but some people really have that. Doing the same thing year after year after year, they're just, "Oh, I don't want to do that exercise again." I think to have that be the problem is actually a win because that's an easier one to solve. There are so many exciting things you can do to switch that up. Those are kind of the ways I came at shaping the list. I'm sure each person who reads it thinks, "Oh, I also struggle with this," but these are the most popular amongst teachers. As far as having the biggest impact on burnout—there might be some other things that all teachers hate, like the parking situation as they come to work, but that doesn't really add that much to burnout. I went for the meatiest and most common ones. *This blog post connects to our upcoming presentation at the Bridging Hearts and Minds of Youth Conference in San Diego on February 12, 2017. Check out the conference to buy a ticket and learn more! Kelly, our Executive Director, and I love students (extraordinarily). We taught in public schools in underserved communities in Los Angeles and Oakland for six and five years, respectively. We worked every day with students who face chronic trauma—off the charts on the ACES scale. In many of our communities, especially in underserved urban areas, school sites are one of the most stable fixtures in students’ lives. Most pre-teens and teenagers actively emotionally develop by attaching to adults outside their nuclear families. In addition, students affected by autism, homelessness, childhood trauma and the foster care system need stability in their teaching populations at an even higher level. When teachers make vital connections to these marginalized youth and then leave, the students in our public schools are affected emotionally and academically. Right now, 46% of teachers in America leave the classroom within five years of entering it So, all the time we spend teaching teachers how to create mindfulness and compassion with youth? Every time one of those highly-trained teachers walks out of the classroom, we have to start all over again. At The Teaching Well, we feel incredibly clear about one thing: we cannot ask teachers to teacher mindfulness and compassion to students without making sure the teachers embody it first. That would be akin to asking a mechanic who doesn’t know about car engines to teach you how to fix yours. 1. Teachers need resilience against Compassion Fatigue. In the context of 2016, finding stress resilience in the face of horrifying news has been part of the national experience, from the death of Americans at the hands of the police to the exhaustive conflict in the presidential race. Constantly “holding space” for the painful experiences of others and our communities is real. And, although it might be new for some, this process of being a participant in someone else’s traumatic experience is a normal, albeit uncomfortable, part of being an educator. Every day, teachers “hold space” for 20 - 200 wonderful student who come from homes with a variety of experiences. This includes their accomplishments, happiness and growth as humans but also their challenges, anger, home struggles and tears. We support learning through connecting the unique experience of each child, and this includes gracefully navigating many young people’s emotional responses. When educators are given space on their school sites to develop collective skills to stay resilient, they are more effective at redirecting students, supporting families and working as a community to raise our next generation. Through concepts like Mirror Neurons or research like Kristen Neff’s on self-compassion, it is proven that how we take care of ourselves through times of stress accurately depicts how well we can react to others. And when we are stressed, our reactions are often exaggerated. As teachers, we are consistently in high-energy, high-expectations situations. It is integral that we have the tools to decrease stress at high impact moments. 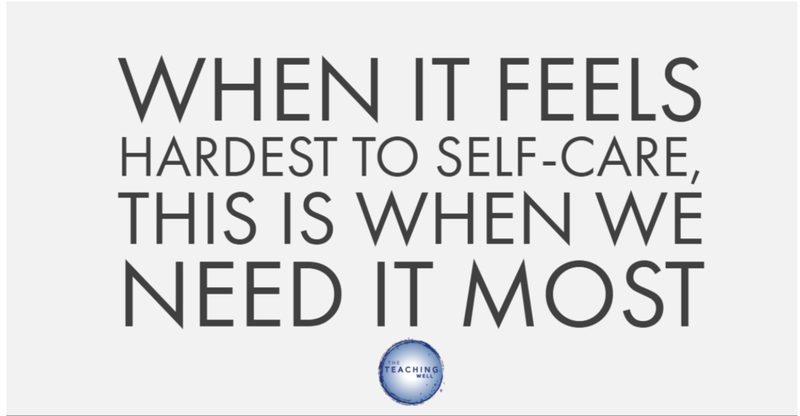 When we speak of self-care at The Teaching Well, we are not talking about adding fluffy stuff to your day to be nice to teachers. We are talking about creating a team that is professionally committed to each other and personally committed their health and wellbeing. And by doing so, we create adult communities that have greater capacity to support students and families. As teachers, working with youth is both our privilege and our life’s passion. It is our responsibility to use mindfulness and self-compassion and care practices to ensure that we are able to commit to our professions for the long-run. An education system full of healthy, mindful and compassionate educators is one that can truly bridge the hearts and minds of youth. Summer is fading and fall is finally here. Our students are setting in, and so are we. I’m hoping most of us are still in our creative calm, and that our stressors are not pushing us to the point of distress or burnout. These moments of settling can offer a joyous time of reflection. Recently, I have been drawn back to reading Don Miguel Ruiz’s The Four Agreements, in which he challenges us to be impeccable with our words, not take anything personally, not make assumptions, and to always do our best. In the teaching world, not taking things personally can be a challenge. Our students are not tabula rasas, nor are we, and both the beauty and the pain of all of our lived experiences can be triggering in a classroom setting. As teachers, it is our job to neutralize traumas, to listen, to support, and sometimes it’s hard to do our best. So how do we do our best, and how do we make sure that our best is the highest quality possible? The answer is clear; we need to take care of ourselves! We need sleep, we need to be healthy, we need to learn how to de-escalate ourselves before we can de-escalate others. When trauma arises in our classrooms we often become reactive because we care. We immediately try to help our students; putting on their facemasks before thinking about putting on our own. This means that we carry our students’ traumas with us, on top of our own, which can lead to an extremely heavy feeling throughout our days. We will never have the capacity to take away all of students’ traumas or potentially even our own traumas; and in reality we shouldn’t want to take it away anyway because our experiences, our students’ experiences, make them the beautiful people they are. But how can we focus on what is in our control? How can we ground ourselves, so we are able to help our students feel their roots and ground themselves? There are many types of stressors: environmental stressors, chemical stressors, mental stressors, emotional stressors, cultural stressors, etc. Our bodies react differently depending on the type of stress, our experiences, and our ability either react, reflect, or do both. We often think about how our brain communicates to our bodies, but our bodies also have the ability to communicate to our brains; and we can train our bodies and brain with signals especially through our senses. Smell is a sense that I have found much refuge in. Something as small as making a cup of grounding tea and breathing it in before I drink it, has given me the ability to ground myself and be more reflective before reacting. One of my favorite grounding teas is Tea India’s Cardamom Chai, check it out, and let me know what you think. Essential oils have also been extremely helpful for me. There are medicinal blends that can be used for specific kinds of stress. Here is a list of helpful essential oils that might guide you to grounding yourself in the classroom. If kept on your desk, you can simply dab it on while walking around, and kids either won’t notice or will smell this grounding, which can help ground them too. Emotional Stress: caused by relationship problems, parental guilt, inability to give or receive love, grief. There are also blends that can be made that are specific for burn out: when you have worn yourself out and are finally moving into distress. This blend is for when you are no longer able to feel empowered in trying to multi-task 5 things at once, waking at 5 and working until 10, when you are incapacitated and overwhelmed in your tiredness. This is often the hardest time to relax, and you may feel like you are just spinning in circles. Your energy is probably completely depleted. Sometimes when I am in this stage I wonder, "How am I going to make it out the door?" When you feel like you have nothing left, it is vital to build up your energy stores again. Exercise and breathing are needed but starting that can be hard. Scent is a great way to start your breath. You can use these blends in your classroom or at home. You can put them in the shower, use them as a massage oil, or you can also just rub in your hands and inhale. I hope this helps you ground yourself and fill YOUR well, so you can give to your students in a sustainable way. The clients who have chosen to work with us this year understood that when their teachers are fully present (healthy mind, body, spirit) in the room, they are able to get through more content in less time. They also hold more clarity on how everyone can bring their strengths equally to the table. Here are three reasons why teacher well-being is integral to a thriving school ecosystem. In the context of this summer, finding resilience in the faces of horrifying facts has been part of the national experience. Whether the death of Americans at the hands of police or the Trump/Hillary Campaign has been haunting your social media, this constant holding space for the painful experiences of others and how it affects our community is real. And, although it might be new for some, this process of being a participant in someone else’s traumatic experience is a normal, albeit uncomfortable, part of being a educator. Consistently, teachers hold space for 20 - 200 wonderful beings who come from homes with a variety of experiences. This includes their accomplishments, happiness and growth as humans but also their challenges, anger, home struggles and tears. We support learning through connecting the the unique experience of each child and this includes gracefully navigating many young people’s emotional responses. When educators are given space on their school sites to develop collective skills to stay resilient, they are more effective at redirecting students, supporting families and each other as a community working together to raise our next generation. 3. How we treat ourselves is how we treat others. Whether we think of Mirror Neurons or Kristen Neff’s self- compassion research, it is proven that how we take care of ourselves through times of stress accurately depicts how well we can react to others. And when we are stressed, our reactions are often exaggerated. As teachers, we are consistently in high-energy, high-expectations situations. It is integral that we have the tools to decrease stress at high impact moments. Join us in the movement-- and tap the well within! There was always something ironic about the way I dealt with the stress of teaching. I’d finish the teaching day around 3, stay to coach or tutor or run a department meeting til around 5:30, then race through Los Angeles traffic (or, more accurately, sit in LA traffic) to get to a 6 pm yoga class. Those were always among the most stressful 30 minutes of my day, but I needed to get to that 6 pm class to de-stress. And, while focusing on the stress of traffic, I wasn’t focusing on the stress of teaching, so I guess that was a plus. But I knew that I needed that 90 minutes of yoga and meditation to stay healthy; not just physically healthy—we all know that as a teacher you’re on your feet most of the day—but mentally healthy. And it’s that mental health that we as educators need to spend more time discussing. One of the most helpful tools I ever saw as a teacher was a graph that mapped the stages of first year teaching (see below): anticipation, survival, disillusionment, rejuvenation, reflection, anticipation again. It was helpful to be able to anticipate what I would be feeling—and most importantly to know that I wasn’t alone in those feelings. But when looking at that, I was also struck by how much of the year would be “survival, disillusionment, rejuvenation” and how irrelevant my education in pedagogy and even English (my subject area) seemed to be when it came to facing those feelings. What I needed to not just cope, but thrive—a necessary prerequisite for my students’ success—were tools for self-care. Without The Teaching Well, I had to pick up these tools on my own (and, of course, with the help of colleagues). Mindfulness was helpful, specifically yoga and meditation; acceptance became necessary and my students and I put up a poster in our classroom that said “I like it when it rains, because if I didn’t like it, it would still rain” which oriented us towards acceptance and optimism; I really celebrated the little victories, which occurred daily, and that we too often ignore; the camaraderie I built among my colleagues was crucial to my well-being; and, finally, maintaining a healthy life outside of my classroom, one that included exercise and friends and travel and reading, helped me maintain a healthy attitude at work. I also shared these strategies with my students, many of whom were experiencing levels of anxiety and stress far more significant than mine. These were the tools of self-care that worked for me. They will be different for other teachers, but the important thing is to focus on this toolbox the same way we do on the pedagogical one. And the reasons for this are many. For one, the stress of teaching forces many teachers, especially ones at the beginning of their careers, to exit the profession, which not only is disruptive for them, but also for their students and their schools. Teacher turnover is also not without cost; teacher attrition costs the U.S. roughly $2.2 billion each year (in recruitment, teacher development, placement, etc.). In the Los Angeles Unified School District (LAUSD), attrition at some schools is well over 50% a year. For those teachers that stay, stress can lead to unhappiness and, as in most professions, unhappy teachers are less effective teachers. One study found that happiness led to a 12% spike in productivity among employees; it’s likely quite higher when your profession is built on human interaction and the ability to motivate and inspire young people. Teachers are of course some of the most selfless individuals in society and, along with that, I find there’s often an unwillingness to focus on themselves because of the need to focus on others, notably their students. But as I always tell young teachers, you can’t be good to your kids if you’re not good to yourself. Then there are of course the non-educational reasons we want teachers to take care of themselves: as people, we simply want them to be happy and healthy. After my time teaching, I decided to run for the LAUSD School Board because of a belief that our educational ecosystem is in need of repair: that everyone in the system, from student to parent to teacher, is not being supported in the ways that would make us all more successful. The true promise of teacher wellness and The Teaching Well is that by focusing on the health, well-being and happiness of teachers, we also improve outcomes for students and schools; the return on this investment, in the form of higher rates of retention and more motivated educators, is one of the highest we could imagine. Teaching is the hardest thing I’ve ever done. Teachers work around the clock, for little money, with extremely high stakes; it is undoubtedly going to be a high stress environment. Ensuring teachers’ well-being is the least we can do. Amidst all the talk of policy panaceas and educational silver bullets, I hope we can focus on the simple, yet profound act of ensuring our teachers are healthy. Nick Melvoin, a former LAUSD middle school teacher, is a candidate for the LAUSD Board of Education in District 4. To learn more, check out www.nickmelvoin.com. Every year as summer approaches, I am deeply reminded of my stress levels. I become mindful of the stress, both positive and negative, that my body feels. It seems as my mind begins to slow as the teacher to-do lists get shorter and I begin to let my body speak to me again. It realizes that it is both exhausted from the year and exhilarated for summer. As summer approaches, I enter the drone zone, where I am excited at the idea of actually being able to make it to the gym more frequently, of being able to schedule more frequent yoga classes, or perhaps joining a summer sports team, of travel, yet sometimes the idea of just sleeping in takes over. Summer is also the time where I tend to reflect on how I can not only incorporate these activities in my summer life but remember how to keep my rituals throughout the year so I continue to feel balanced in the classroom. As a teacher, sometimes it can feel like we live in a polarized environment: giving 150% of ourselves during the school year and then when summer hits, we are re-cooperating the extra 50% we gave. We often have to re-fill our wells of giving during the summer. Every year of teaching, I would set grandiose ideas during summer of how to improve my work-life-balance, but now I am left wondering, “How can we make our lives more balanced?” Surely there has to a less polarized and more balanced way to approach a profession that I love. As teachers, we know that students need balance and consistency. We can see and feel how deeply it affects our students bodies, minds, and ability to perform as well as connect socially with peers. When we think of our students we know that balance is not something that happens to us, it is something that we do. Balance is something that needs to be practiced consistently. Suddenly I am left wondering, why then, do we as teachers, swing on a pendulum of summer life verse school life? An example of this would be learning how to ride a bicycle. In the beginning, when we learn how to ride, it is easiest to balance when the bicycle is in full motion. The hardest part of learning to ride a bicycle is how to slow down and stop without falling off. As teachers, how do we learn to slow down and stop with off falling off the bicycle? How can we bring balance to ourselves? As our balance improves, we become able to slow down the bicycle and control it at slower speeds. I challenge you to practice being present during summer: to set yourself up with consistency of mindfulness that will carry you into your next year. I challenge you to slow down the bicycle in the comfort of summer to help improve your balance. Here are some mindfulness and stress resilience techniques from The Teaching Well that might help. What: The more you can stay present the better you feel. Integrating mindfulness into daily life is the best way to practice consistency. How: This activity should be physical so you can focus on details of your experience. It doesn’t matter what physical activity you choose, rather the point is to focus your attention on the sensations you feel. For example, you could choose to be mindful while doing the dishes. You can focus on the feeling of the hot water on your hand, the smell of the soap, texture of the sponge, your feet grounding into the floor, the muscles in your arm as you scrub. What: Inhabiting your body and being aware of your body physically creates a stronger immune system. A body scan can make you more aware of your body’s cues. Your body loves attention and it is a way of bringing self-healing. Most illnesses sneak in when we are not present in the body. How: Self-Healing Meditation to boost your immune system is most effective just before you fall asleep at night or just as you are waking up in the morning. You want to flood your body with awareness. Close your eyes and lie down. Then choose different parts of your body to focus your attention on: feet, legs, lower abdomen, chest, arms, etc. Try to feel the energy in those places. What is your body telling you? Send your energy to the parts of your body that you feel need it. Hold the attention for just a few minutes, and if your mind wanders, don’t judge it, just bring your mind back to the focus of your body. What: Your senses can often bring your back into the present. How: Notice three objects you see in a room and pay close attention to their details (shape, color, texture, size, etc). Linger over each objects and name three characteristics of the object out loud. For example It’s blue, cylinder shaped, and waxy.” Repeat this for each sense. Notice three sounds and now three characteristics of the sound. “Its loud, pleasant, ticking.” Touch three objects and describe their characteristics. Remind yourself that you are present with these environmental objects, you are in the here and now. What: When you feel as though you are not grounded a pleasant smell is powerful way to bring you back into the present. How: Carry something that smells pleasant with you, a lotion, oil, perfume, a fruit. You can also find things in your environment: a flower, fruit, herb, etc. Here’s to a balanced summer that will help you take care of yourself so you can teach well in August. Contrary to popular belief, martyrdom doesn’t produce the best results. When teachers feel fulfilled, that’s when they teach most effectively. It’s unrealistic to expect teachers -- and most people in the public service/social justice sector -- to give themselves unconditionally for long periods of time. What is realistic is for people to give when they themselves already feel at peace. There’s a famous Sufi saying that says “Give from the overflow of your well, not from its depths.” When we’re feeling unsatisfied or overwhelmed, and our “well” is empty, it’s difficult to serve others. When we have unmet needs, it’s more common for us to “take it out” on others, including our students. But when people focus first on filling their own “well” by making themselves happy and healthy, it becomes far easier to “give from the overflow.” When teachers feel fulfilled, it creates space for us to take on the responsibility of others and serve without resentment. So as teachers and givers, it’s important to ask ourselves: “How do I love and take care of myself each day? What do I need to be in a “well overflowing” place?” For some people, there well is filled quite quickly. For others, it takes more time, effort, and prioritizing to ensure that their needs are being met. This also relates back to the Human Function Graph. The spot before the apex is where your well is filled, where you can are still able to take on the heavy responsibility of a teaching job without feeling depleted. It’s far more realistic to give from that place of extensive resources, than when we’re already in distress. The Teaching Well is founded and shepherded by a team of former teachers, all of whom have taught in public, private and charter schools around the country—all of them for over five years and many for more than a decade. We were all highly driven, highly successful educators who know what its like to try and give from an empty well. We also have all found that our lives and the lives of our students dramatically increased when we started taking care of ourselves FIRST. In this discovery, we knew we had to give back to our communities what we had learned. Thus, The Teaching Well was born. As a team, we support teachers and administrators in tapping their wells within, so that they may give from their overflow. We aim to bring this valuable resource to the communities who need it the most—so that they can sustain the lives and dreams of the students who need them.